It’s the time of the year when everybody starts making their new year’s resolution. Whether it’s related to relationship, health, career or even about just taking more risk. Whatever it may be, I’m pretty sure that money is always involved. So maybe the best resolution you might want to consider is in fact creating a “money plan”, also known as a financial plan. You may have heard about this from a friend, colleague or even just browsing through the net. What is financial planning? Do I need one? How can I start? Are there professionals or organizations that can help? Financial planning is the process of meeting your life goals through the proper management of your resources by taking into consideration your dreams, needs, idiosyncrasies and financial resources. These life goals may range from something as specific as buying your first car to planning up for your retirement or you can opt for a full comprehensive plan. The biggest benefit of having a financial plan is that it provides direction and allows you to understand how each financial decision you make affects other areas of your finances. Much like building a house, your financial plan will serve as your blueprint. For example, equities might help increase your passive income but may also provide much volatility in the short term. Inversely, instruments like money market where volatility will be low may affect your long term returns for your retirement plan. By viewing each financial decision as part of a whole, you can consider its short and long-term effects on your life goals. You can also adapt easily to life changes and feel more secure that your goals are on track. There are a good number of personal finance apps or self-help books that can help you do your own financial planning. However, I will always encourage you to seek help from a professional financial planner. A financial planner helps individuals meet their medium and long-term financial goals while balancing it with his short term needs by using the financial planning process. He is tasked to analyze your status and set up a program to help meet those goals and monitor them in a timely manner. This big picture approach to your financial goals sets the planner apart from other financial advisers, who may have been trained to focus on a particular area of your financial life. 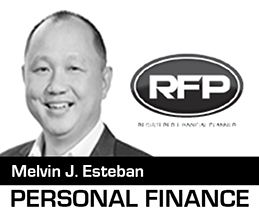 Just a word of caution, choosing a professional financial planner can be harder than it seems as there is no governing body here in the Philippines to deal with it. There are private groups or companies that provide their own certification. They are subjective and not standardized. Anyone can easily claim to be one. So my best advice, don’t look at just titles or designations. Find out more about their credentials, past works, experiences, references, area of expertise, etc. Watch out for my article on “Tips on choosing a financial planner”. There are five steps involved in creating successful financial plan. By using these five steps, you can have a better appreciation of where you are now, where you want to be, and how to reach that goal. You may need to add a pre step if you plan to work with a professional financial planner, that is to establish and define your relationship with the planner. It’s very important that you set each other’s expectation. Remember that this will entail team work. Know the responsibilities of each other. Gather your data and establish your personal and financial goals. The key is to be SMARTER (Specific, Measurable, Attainable, Relevant, Time Bound, Escalating and Rewarding) in setting goals. Analyze and evaluate your finances. Now that you see the “big picture”, do the pieces make sense? Do you need to adjust, reduce, add or reallocate? Develop your action plan and consider some alternatives. Understand that each financial decision you will make can affect other areas of your plan. Again, be mindful of the big picture. Implement the plan. Believe it or not, some may find this the hardest as people has the tendency to just procrastinate. Monitor and update your plan. Things do not always go as planned. You need to change and tweak your parameters from time to time for your plan to remain relevant. Understanding each of these steps is very vital to ensure that you’re doing it right. I will dedicate my next article to discuss this in greater detail but in the meantime, happy wealthy living! Next: Will The Stock Market Hit All-Time High This Year?